Looking for a change? Are you ready to express yourself more fully but don’t have the means (emotionally and/or financially) to go to clothing shops and feel free, seen and comfortable? Do you have clothes that once hugged you like a friend, that now it is time to say goodbye to? Want to try on some new looks – with no commitment or pressure, in a friendly and supportive environment? 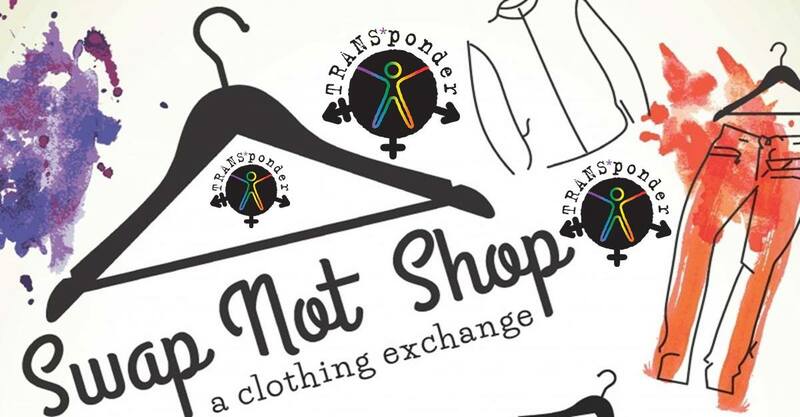 Trans*Ponder is partnering with Spectrum and As You Like It – The Pleasure Shop to offer a FREE, ALL AGES, Trans/Gender Diverse clothing swap on Saturday, November 17th from 1-4 pm in the back of 150 W Broadway, Eugene, OR 97401. There will be private “fitting rooms.” This is a Trans/Gender Diverse Centered Event, and all people are welcome. As You Like It – The Pleasure Shop at 1655 West 11th is a drop off location for clothes if you cannot make it to the event. You can also email us info@transponder.community to try and make arrangements. We will have binders and bras and possibly other gender affirming products at this event. We will start taking clothing at 12:30, so PLEASE bring your CLEAN, intact clothing to offer. Please bring a personal bag to take your treasures home in. Also if you have spare full length mirrors for us to borrow it is very helpful. We will be DELIGHTED to have volunteers show up at 12:30 and throughout the time to help us organize, and at 4, to clean up to clear the space by 5.! It takes a village! Please email us at info@transponder.community to sign up!